Don't take it from me. Listen to the experts who say that non-sustainable farming practices hurt public health, drain small communities, abuse animals and pollute the environment according to 2 and 1/2 years worth of research performed by Pew and Johns Hopkins' Bloomberg School of Public Health. This report doesn't point out the notion that everybody should be vegetarian overnight. I can wait at least a few years before you join me on the dark side. What it does highlight is that you should have a better understanding of how the food you eat impacts everybody's health. It can impact species by creating drug-resistant bacteria strains. It can pollute the planet. It also can damage the soil. The phrase goes, "Think globally; act locally," and nowhere is this rationale more appropriate than on your dinner plate. Just say no to the slop from the McCorparations. The impact extends beyond the quality of food in your kitchen and impacts the quality of life across the planet, from water and air quality to considerations of your karma after you have decided to eat an egg salad sandwich sourced from the above pictured torture den. 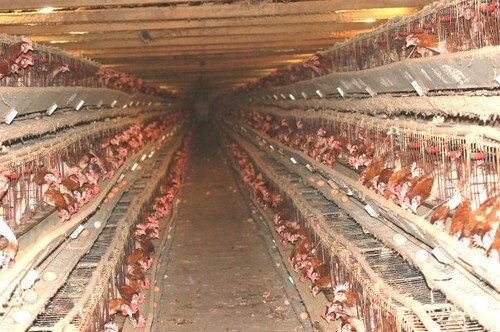 The factory farms that thrive today can't sell a product that nobody is buying. Take care in the manner in which you eat, because the law of unintended consequences says these seemingly innocuous decisions can lead to a disastrous conclusion. The impact from deciding to eat local items farmed by capable artisans producing veggies and (gasp) meat can indeed influence the quality of life for future generations. Click the links in the article to see what a bunch of people with far more education than myself think about the issue.